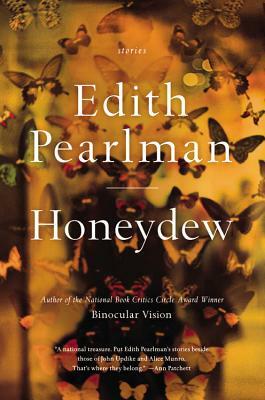 Edith Pearlman's last collection, Binocular Vision, won the National Book Critics Circle Award and was a finalist for the National Book Award as well as the Los Angeles Times Book Prize and the Story Prize. The author of three other story collections, she has also received the PEN/Malamud Award for excellence in the short story. Her widely admired stories have been reprinted numerous times in The Best American Short Stories, The O. Henry Prize Stories, and The Pushcart Prize. A New Englander by both birth and preference, Pearlman lives with her husband in Brookline, Massachusetts. "Honeydew should cement [Pearlman's] reputation as one of the most essential short story visionaries of our time." "There remain a few dedicated practitioners of the short story, and Edith Pearlman is one to be cherished... The 20 stories [in Honeydew] are vinegary, rueful, droll, humane and endlessly inquisitive. Though intricately constructed, they are slight in drama and emphasis, set down like a light footprint that nevertheless fixes itself in one's memory as though pressed in wet cement." "One of the key dynamics of Pearlman's fiction is the ability she has to reveal someone in an instant... [Honeydew] cements her reputation as an American short fiction avatar. The work is smart and deeply rendered, full of striking observations and some of the best sentences you'll ever want to read... I bow my head in awe... Ruthless writing, sharp and piercing." "If you have never read Edith Pearlman, you're in for a lovely surprise, and if you have, you're in for another treat... Honeydew is ripe with often bittersweet, unconventional love stories that somehow manage to encompass loss and pain yet reaffirm the value of living... Like Alice Munro, Pearlman deftly encapsulates whole lifetimes in compact stories by focusing on pivotal moments that reverberate over decades." "Exquisite work... Such narrative judgment and authority are a pleasure to be in the presence of... This newest book contains 20 stories in fewer than 300 pages, and even the shortest among them convey a depth and a texture well out of proportion to what their word counts might suggest them capable of." "Honeydew will afford an international audience another opportunity to enjoy Pearlman's distinctive and memorable fictions... Pearlman's stories--slightly old-fashioned in their use of conceit; refreshingly loose in their capacity for digression or tangent; occasionally Whartonian in the bemused and acidic clarity of their narrative eye--are sui generis...[these stories] share a particular perspective that, like a perfume, floats throughout... to make of life's everyday leavings a life-saving nectar--is perhaps, Pearlman's most consistent endeavor. She is wise, yes, but also unfailingly generous, even joyous... it certainly makes her fiction a fortifying pleasure to read." "Edith Pearlman's short stories have often been compared with John Updike's, and the comparison is apt...All of the powerful emotions are depicted in rich, controlled prose, one of the earmarks of a Pearlman story. Whether it be for carefully dissecting her characters' feelings or observing tiny details, Pearlman reveals her acute eye time and time again... In the tradition of Joyce, Chekhov, Updike and Munro, Pearlman's surprising, memorable stories are joys to behold."